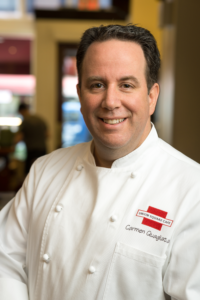 As the Executive Chef of Union Square Cafe and Daily Provisions, Carmen Quagliata explores and develops his passion for his native Italian cuisine in one of the country’s most beloved restaurants. Carmen first joined the Union Square Cafe team as the Chef de Cuisine, working under Chef Michael Romano. He was promoted to Executive Chef in September 2007, where he has remained at the helm, eventually transitioning the restaurant from its original home on 16th Street to its new location on 19th Street in 2016. Soon after relocating, Carmen and his team earned three stars from the New York Times.